The "fourth form factor (4FF) UICC," or nano-SIM standard looks to trim even more mass off the already small micro-SIM used by handsets like the iPhone to allow for larger batteries, more components and a slimmer design, reports The Verge. ETSI mandated that the new nano-SIM card must have at least eight electrical contacts, though left the layout up to the companies which is why the proposals submitted by Apple, Nokia and RIM have three unique designs. 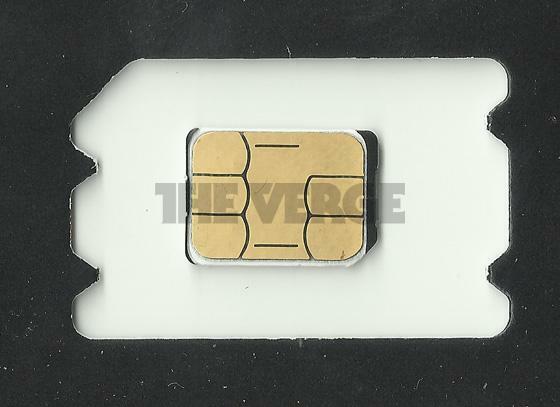 Apple's proposed design, being prototyped by SIM maker Oberthur Technologies, looks much like the existing micro-SIM card minus most of the plastic edging. The contacts are in the same configuration as current cards and could theoretically be used in existing hardware if outfitted with an adapter. Nokia says that Apple's proposal is in violation of an ETSI requirement that states the nano-SIM design "shall prevent the 4FF from becoming jammed in a Mini-UICC reader." Indeed, the length of Apple's nano-SIM card is nearly identical to the width of current micro-SIMs and could accidentally be inserted into a non-conforming device. The designs from Nokia and RIM are more unconventional and resemble microSD cards. The two variations are meant to be used as standalone cards while Apple's solution requires the use of a card tray. Apple is seeing so much resistance because its rivals are concerned that the iPhone maker could claim ownership of the patents behind the nano-SIM format and subsequently charge royalties for its use. Earlier on Monday the Cupertino, Calif., company pledged that it would allow royalty-free licensing if competitors agreed to back the company's format. ETSI is scheduled to vote on which of the three designs will become the new standard at a meeting this Thursday.